If you told me on January 1, 2014 what my life would be like on December 31, 2014 it would be unlikely I would have believed you. On January 1 I had a job that I felt like was finally going in the right direction, working in a historic district just off the same street my great great grandfather worked. I was making a dent in saving money and thinking about traveling to South America (and banking vacation days). I was going to the gym for weight lifting and pilates classes to help stay fit and mentally fit at the same time. I lived in a cozy house in a semi-rural area about 30 minutes away from work and I cooked dinner most nights. Today I work for a new employer who seems to reward and recognize my contributions. I work out of one of the fastest growing areas in St. Louis that didn’t even exist about a decade ago. I stopped going to the gym when my commute became over 2 hours a day and found myself feeling miserable while my husband took over the kitchen duties and turned out to be an amazing cook. 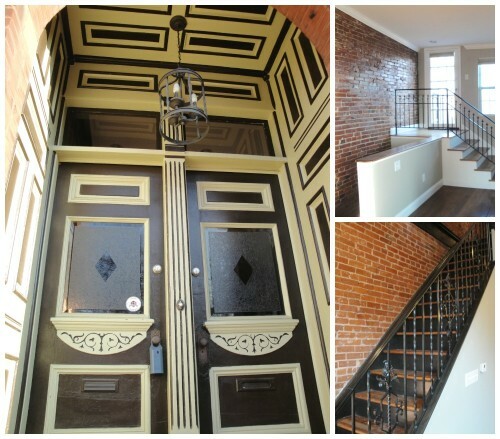 I’ve also moved into a 3-story city home built over 100 years ago right in the heart of St. Louis City. And my husband is still cooking dinner even though my commute is half that of what it was on January 1. I’ve gone through some major changes this year and not everything was great. Most of it was terrifying. But sitting here on December 31 with the family I love in my new house on New Year’s Eve, I feel full of hope. 2015 will be a better year and I’m in a great place to enjoy it, physically and mentally. My employer (the new one): I can’t even begin to describe how incredulous I am when they do something that recognizes the work I do. It’s so humbling and while I took a chance on them, they took a chance on me when I needed it most. My employer (the old one): In a way they gave me the shove I needed when I got so depressed that I really felt I wasn’t worth it. It’s hard to leave something safe but some of the people I met there changed my life. My girls: Speaking of those people, I cannot believe the three lovely ladies that I’ve grown so close to over the past year. I only met one in 2012 and the others in 2013 and now every month I see them and enjoy drinks or pancakes and they still love me even though I quit working on their team. These girls loved me enough to tell me to get the heck out and that’s friendship. My dog: What a patient little demon! My husband: Words cannot express how grateful I am to him. Daniel has stepped up to run the entire household while I commuted or cried over bad days and he did it while having his own job and troubles. I know that’s marriage but year 7 was filled with work chaos, house chaos, and not having time for each other. When I log off here I’ll spend the rest of the night with him because he really is the best person I know, even though he’ll deny it. 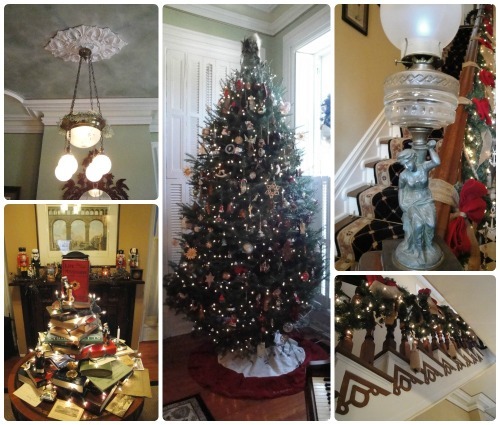 Here’s a preview of the house and I’ll share more of it with you in 2015. Enjoy your farewell to 2014 and I’ll see you next year! I’ve been having a bit of a time getting into the Christmas spirit for reasons that will soon be clear. I did make a few attempts to get in the mood though. One of my 30before30 goals was to adopt a family for Christmas. I had no idea how hard this would be. I work for a satellite location of my main employer so I couldn’t easily join their program, my church wouldn’t be doing theirs until far too late for me to be prepared, and when I called the country social services program they were all out before the middle of November. That’s an amazing thing for all those families but I knew there still had to be a market. I managed to find one via my last employer’s giving tree, getting a mom and her daughter. I made sure to get them everything on their list and threw in a few extra holiday treats and gift cards so they can do some extra shopping too. It was an easy project but one that did make a difference. The other way I got into the holiday spirit was by going on my last date night of the year. Another of my 30before30 goals was to go on a monthly date night for all of 2014. Date night had to be a meal + an activity. Can I just say I chose the absolute worst year for such a goal? (Don’t even get me started on the goal for Peru…) I had my job go from decent to destructive, I got a new job, had to start a new satellite office for my employer, my husband’s job took up a lot of his time, I stopped working out, my commute doubled/tripled, someone hit my car, a beloved high school teacher of mine passed away from cancer which sent me on a minor freakout, I decided to buy a house in January and spent all year looking, and decided to sell my own home. I don’t mean to say that my year was a bad one but it was unnecessarily stressful and I really just want to move on to 2015 and all its potential. Date nights for this year were hard due to scheduling, snow, stress, and at times being a little unhappy with where things stood in life. That’s probably why I wanted the date nights more than ever but there were moments when trying to grab a meal and a movie seemed like the most painful experience in the world. Thankfully our December date night was a much better ending to the series. All those issues from before were over. My husband and I decided to take some time off work so this past weekend didn’t have work looming over us. 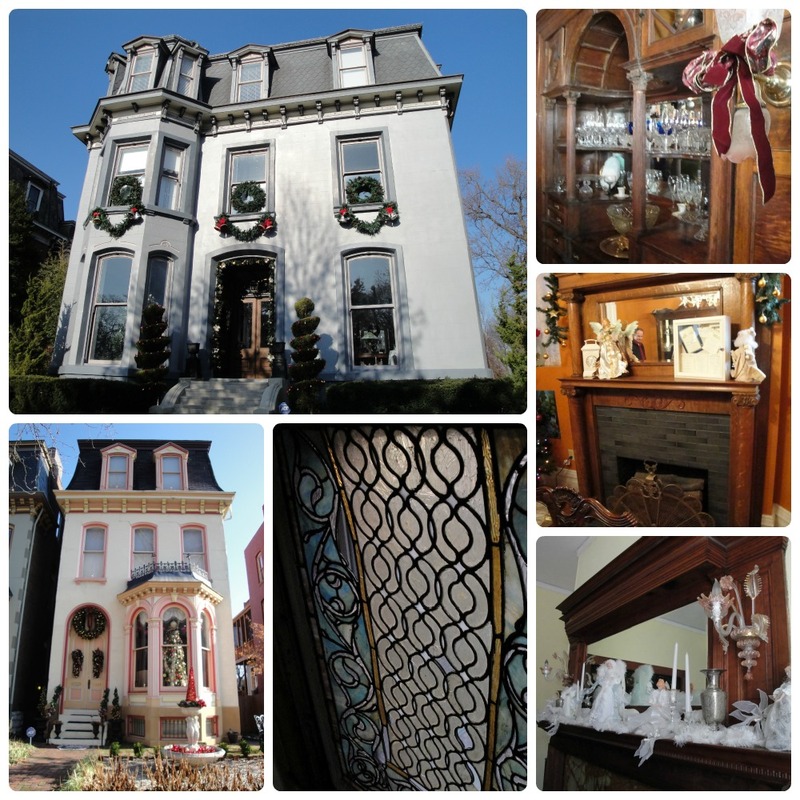 We took my parents out to the Lafayette Square Holiday Parlor Tour in St. Louis. Lafayette Square is an old historic neighborhood in one part of the city. It was hit by a tornado years ago and parts of the neighborhood fell into decay while others aged and needed improvement. Starting in the 1980s the neighborhood improvement picked up the pace and they started renovating what could be fixed and doing matching infill to keep up the historic charm of the neighborhood. Now upscale bars, small businesses, art galleries, and brunch spots have moved in. When you see bad things about St. Louis on the news, know that the city and county are huge places and there are so many great things here. 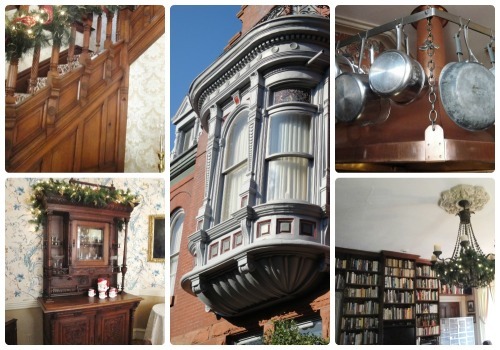 A few times a year homes open their doors for tours. 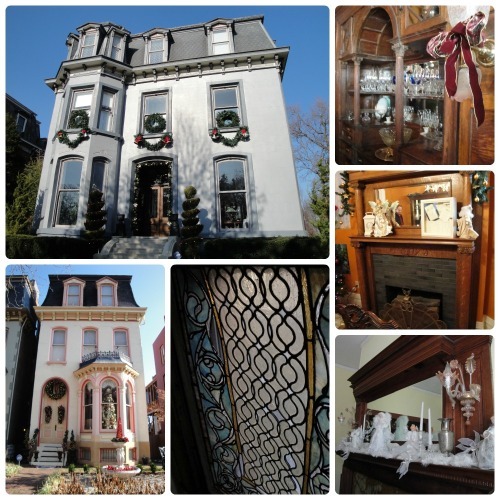 It’s a great chance to see how people have improved their homes, their antique decor, or just their fun touches on the houses. After making it to most of the homes we jumped to the county for a meal at Pastaria. 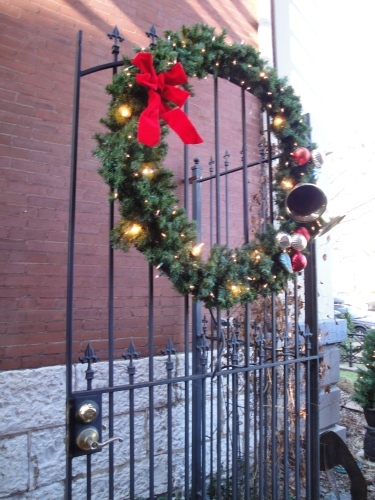 Pastaria is run by one of the top chefs in STL and the country, Gerard Craft. Pastaria isn’t one of those snooty kinds of places though. You can get pizza, pasta, and gelato and go home happy. The gelato is always a fun experience. Last time I went I got a salted caramel. This time I ended up with a blackened carrot while my parents ended up with a parsnip one. You just never know what you’ll get except you’ll be stuffed when you leave. Date nights ended on a good note. I hope in 2015 we can keep making our best attempts to go on date nights and they can be a bit more spontaneous and convenient. I mentioned in my last post that I am obsessed with Serial. Really, I’ve become obsessed with podcasts as a form of entertainment. I drive over an hour each way to work and sometimes my commute turns into 3-hours round trip. It’s all temporary but my sanity was slipping listening to talk radio. My mind wanders too much right now for audio books so I decided short blurbs of topical programming would be a good form of entertainment. If you have an iPhone, iTunes is set up to catch and download most programs. It’s really easy. 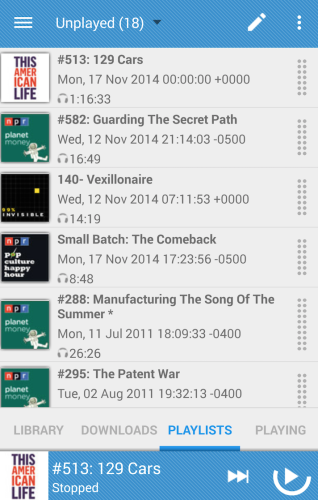 For me, I have an Android phone and tested out a few apps before settling on Podcast Republic. I like the interface and love that it has some car-friendly options. This one got its own post but really, if you like crime, True Detective, mysteries, or the #1 podcast in America then start with Serial. Start from the beginning and try not to binge listen (but you won’t be able to avoid it). Radiolab was the first podcast I’ve listened to. While not without controversy, most episodes touch on scientific topics but it also includes philosophy and individual narratives. Colors is a beautiful episode to start with. 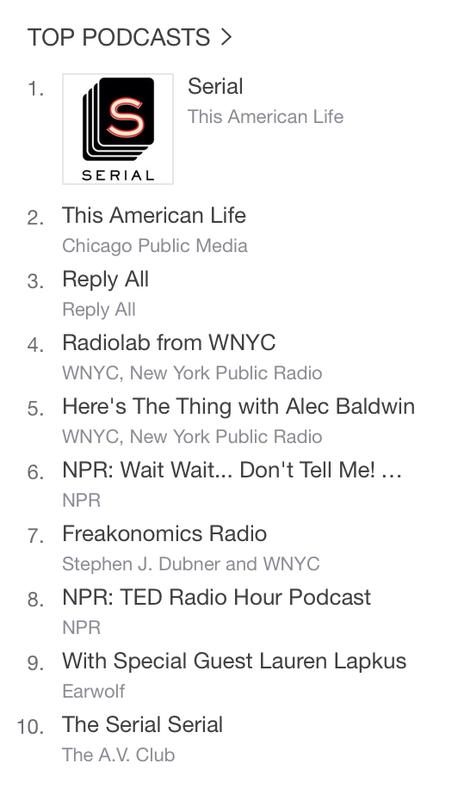 This American Life seems to be a classic for most people. Interestingly I worked for a man featured on TAL this past year. Serial is actually a spinoff of TAL. Think of this show as a glimpse of other people’s lives. A set of favorites include Harper High School part 1 and part 2. What sounds more boring than a show about finances and the economy? Trust me, I took 4 econ classes in college and hated them all. Planet Money is different. It’s educating while not being boring and helps to discuss all those things you wish the news told you about. 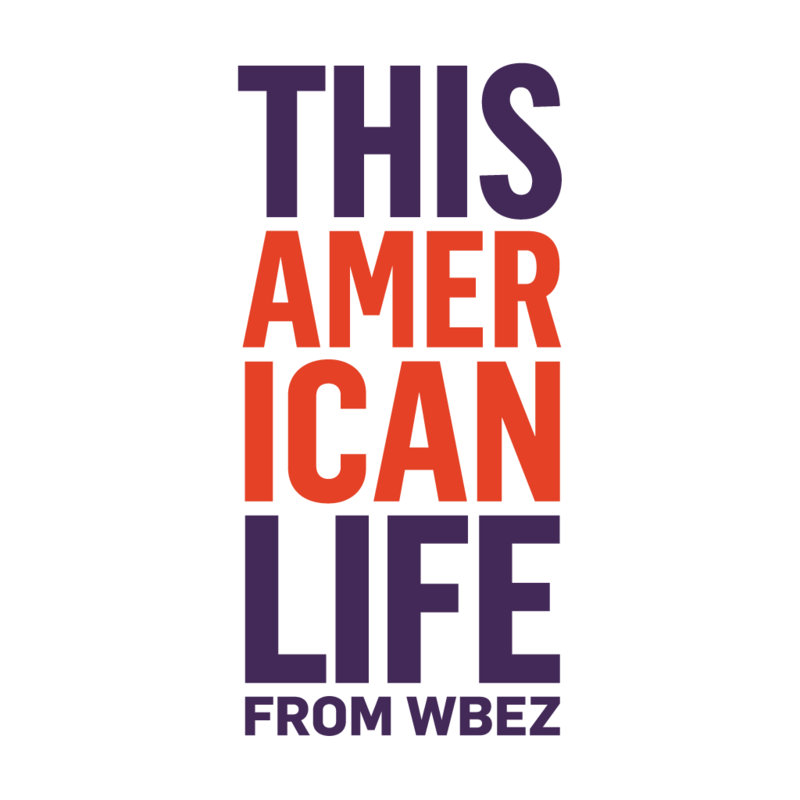 This show is a sister program to This American Life as well. When Women Stopped Coding was a recent episode that I loved. Pop Culture Happy Hour is the perfect palette cleanser. You get a good discussion of something in pop culture, often looked at from outside-the-box ideologies. Then you get a laundry list of what is making the hosts happy. The name of the show really says it all. I’m often inspired to consume new media or look at what I’m consuming in a new way. It’s best to listen to the current ones but I’ll always recommend It’s That Time of Year so Get Ready for the Bells for its epic rant and devotion to the heat and snow misers. Honorable Mentions: I’m still digesting some of these but I’ll say that Pitch, Criminal, and 99% Invisible have all joined my regular rotation. While I love NPR podcasts these all deserve the love too. Are you listening to podcasts? What shows am I missing? If you had told me a year ago that every Thursday morning I would wake up early just to download a public radio production, I would have laughed at you. Snorted really. I am the opposite of a morning person. I’ve been known to stay up late even just to sleep through mornings so I don’t have to live through them. So what’s changed? Serial. It’s my new obsession and it’s likely infiltrated your life in some way. It’s one story told week-by-week and a spin-off of This American Life (TAL). I was never that into TAL but I had just downloaded a new app for listening to podcasts and downloaded a new episode called “The Alibi” the first week of October. 53 minutes later and I was hooked. There was no turning back. Serial comes out each Thursday morning. The first episode spells out the premise: in January 1999 a teenage girl named Hae Min Lee disappears. Six weeks later her ex-boyfriend, Adnan Syed, is arrested. He’s convicted and sentenced to life in prison. It should seem open and shut but it isn’t thanks to issues like a witness changing stories, alibis not fleshed out, emerging technologies, confirmation bias, how our court systems work, and that sometimes the justice system isn’t about justice. The host, Sarah Koenig, does a wonderful job of focusing each week on a niche of the investigation, the disappearance, teenage interactions, the trial, and the resulting prison sentence. This past week she had us focus on the victim, Hae, and what she was like. She wasn’t always a murder victim and she had so many people who loved her and cared about her. Then Koenig focused on Adnan and what he’s like now and I realized that I want justice for both of them, even if I don’t know what that is. So today I’ll sit in my car and drive into work listening for another week and learning more about the case and myself. I’ll hear the haunting theme music that sends shivers down my spine and I’ll continue to let Koenig weave her story and maybe I’ll learn something more about the case or just myself.